El Niño is coming, are you ready for the rain? Today Caltrans hosted a multi-agency press conference regarding El Niño; focusing on what to expect, how to be prepared and what public safety agencies are doing to be prepared. Guest speaker, San Bernardino County Fire Assistant Chief Don Trapp, warned citizens that each year, more deaths occur due to flooding than from any other severe weather related hazard; siting already this year we have seen multiple major flooding and mudslide events. In mid-October, flooding and mud flows trapped hundreds of motorists in adjacent counties and forced the temporary closure of the I-5 freeway through the Tehachapi Mountains. In early September a couple on a first date got caught in a flash flood at Mill Creek crossing in Forest Falls. While she was able to make it to shore, he did not make it out of the water alive. Chief Trapp went on to state the main cause of so many injuries and deaths is due to people underestimating the force and power of water. More than half of all flood related deaths result from vehicles being swept downstream. Rescue 72 and Swift Water Rescue 72 were on hand to exhibit specialized equipment used to perform a swift-water rescue. Nearly all of County Fire’s first-response equipment is equipped with swift-water rescue gear, which includes dry-suits, floating ropes, personal flotation devices, and other rescue equipment. All San Bernardino County firefighters receive basic swift-water rescue training, and well over 100 firefighters are trained in advanced swift-water rescue skills. San Bernardino County Fire reminds residents to download and use the free Ready!Set!Go! Flood Preparation brochure on our website at www.sbcfire.og. In it you will find information about what to do before, during and after a flooding event. The best preparation for possible flooding is to plan ahead. The Ready!Set!Go! brochure will show you some of the things you can do to protect your home, property and family. There are three simple steps you can take to help protect your home from floodwaters and debris: Ready, Set, and Go! Be Ready. In the brochure you’ll find information about how to prepare for wet weather, things like cleaning out rain gutters and storm drains, where you can sign up for emergency alerts, fire stations that have sandbags available, and what you should have in an emergency kit. There is also specific information for areas that have recently been burned by wildfire. Get Set. When heavy rain has been forecast – or when heavy, steady rain is falling – monitor the news media, websites and social media sites for updated weather conditions. The phrasing meteorologists use is important; a Flood Watch means flooding is possible in your area, Flood Warning means flooding in your area is already occurring or is imminent, and Flash Flood is sudden violent flooding. Flash floods often come up quickly during heavy rain. Practice “situational awareness.” Know and understand what is going on around you so that if conditions worsen you can take the necessary actions to protect your home and family. Being ready for any sort of flooding is important. Go when you’re told. If flooding occurs, you are safest staying in your home if it is not being affected by floodwaters, mud or debris. If asked to evacuate, do so immediately and proceed to higher ground or an established shelter. If the water rises suddenly and you cannot evacuate, move to the second floor or, if necessary, the roof. If you’re asked to leave, evacuate to higher ground taking your emergency kit and valuables. Don’t forget medications and important documents! Pay attention to your surroundings; look for swift moving water, downed power lines, and debris. Get your Ready!Set!Go! Flood Preparation brochure and set up a plan now. Having one and practicing it can save you and your family when an emergency comes. Get yours at www.sbcfire.org. You can also obtain a list of fire stations that have free sand and sandbags. 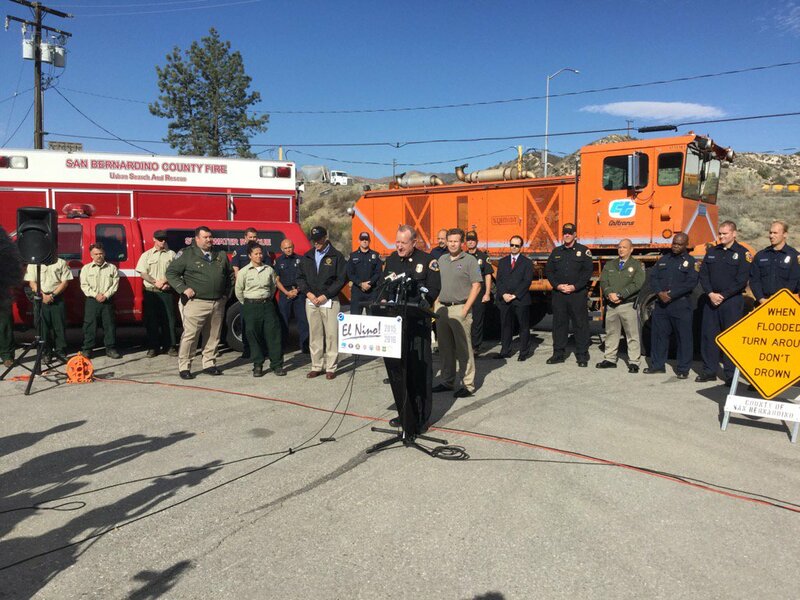 Read more about the news conference here with information from Caltrans.